The Celtic defender missed out on a showpiece event with Cardiff City in 2010 and is determined to make up for that by playing in the Scottish Communities League Cup final. 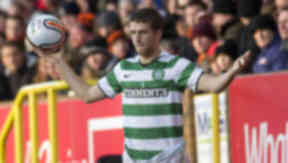 Adam Matthews is eagerly anticipating the prospect of his first taste of action in a cup final, as Celtic prepare to face Kilmarnock this weekend. The closest the Welsh defender came to featuring at a showpiece event came in 2010, when he missed out on a place in the Cardiff City team which lost the Championship play-off final to Blackpool. Matthews, 20, is vying with Cha Du-ri and Mikael Lustig for a starting berth at right back but is determined to play his part in winning his first trophy for the Glasgow club. "I've been in a play-off final but didn't play so this will be my first one," Matthews said. "I wasn't on the bench, just in the squad. I was only 17. "It was a disappointment but that made me a better player and more determined to play in big games. "When you become a footballer, every footballer wants to play in a final. That's one of the reasons I came to Celtic. Hopefully it will be a good occasion and we'll get to lift the trophy at the end of it." Matthews was given the nod for Celtic’s last game against Dundee United, a 4-0 win at Tannadice in the Scottish Cup. The player admits he has no idea whether he will again be preferred for Sunday’s match but hopes he has done enough to convince Neil Lennon to keep his faith in him. Asked if he thought he would start, Matthews replied: "I'm not sure, but whoever has played in the right-back position has done well, we have got three different-class people to play in that position so it was always going to be tough to keep my place. "But hopefully I justified myself against Dundee [United] and can keep my place for the final. "A player would be gutted to miss out on the final but I just have to keep working hard in training and it's the gaffer's decision."